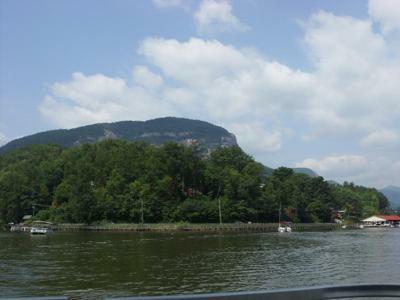 We had a wonderful ride on Sunday we rode over to Lake Lure NC and took a boat ride around the Lake. 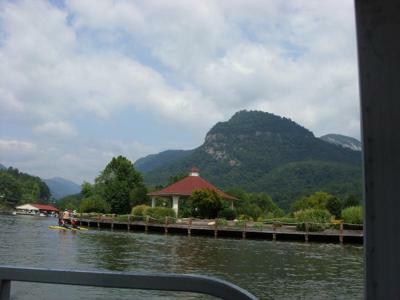 On the water you get a quick history of the Lake, this is where the movie Dirty Dancing was filmed back in the 80's also the movie the Last of the Mohicans was filmed right there in Chimney Rock NC some beautiful country if you get a chance come see it. Nice pictures Lois. Thanks for sharing. 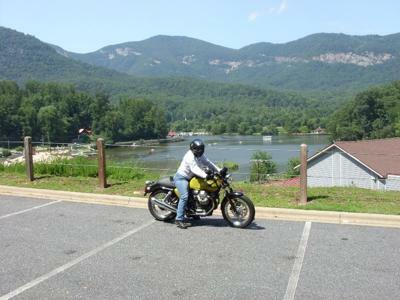 Thanks the guzzi is a 2010 I can do about 200 miles a day without any trouble but I'm thinking about getting a cafe sport fairing for it. I also have a ninja 500 when take trips I use it it just a lot easier to pack a load on it, saddle bags top pack and tankbag all fit nice. 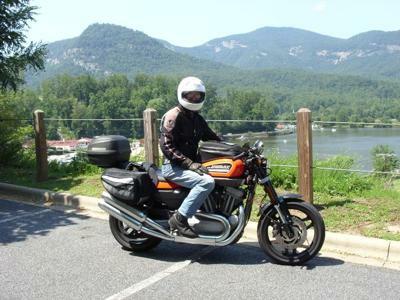 What year is your Moto Guzzi? Nice looking bike, Btw! How do you find riding with no windscreen? Does it get tiring on long rides? Thanks for the information! Looks like a great place to visit.